So, I’ve been reading about the “Smart Choices” program drama lately – and I know this is going to sound bitchy – but seriously? Are we so apathetic and willing to be manipulated that an f-ing checkmark on a food package is going to sway us? Don’t know about this program? It’s the one that mostly promotes highly processed products as “smart choices” in exchange for $100,000. I know I’m a cynic – I embrace that. Thinking I might be swayed to purchase a product because the manufacturer tells me it’s the “smart choice” … opposed to the competition? Well … uhhh … again … seriously? I’m not immune to the insanity. I very vividly remember the day I picked up a “healthy” and “whole grain” version of a cereal before I spotted my beloved junkier brand/type on a lower shelf. I picked up the “junkier” version and imagine my surprise when I found that they were virtually nutritionally identical. I think that’s the day I stopped buying cereal altogether. Anyway. I was SO not ready for this week to start … but it did. 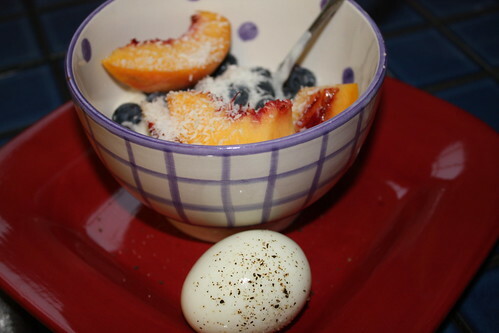 Jon boiled a bunch of eggs this morning, so I had one for breakfast with my fruit/yogurt. I added a little unsweetened coconut to the fruit/yogurt this morning and am planning to keep doing that. Not quite as good as the sweetened version, but good nonetheless. 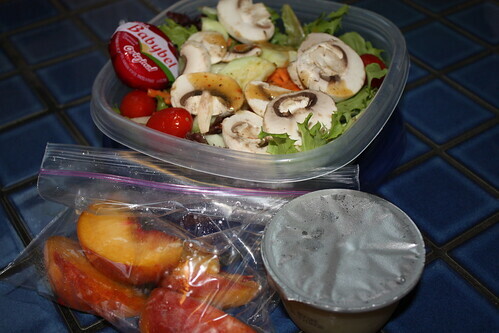 I packed a salad and a babybel and some unsweetened applesauce … and the 1/2 of the peach I didn’t use in my breakfast yogurt. 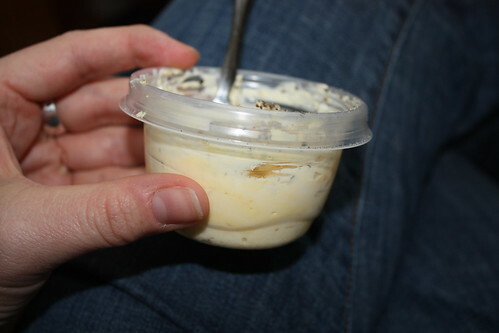 The applesauce is pretty heavy carb-wise, but I like it … it’s easy to pack. I was hungry when I got home, so I raided the hard-boiled eggs again to make a little egg salad. We haven’t had actual bread in our house in months, but I swear I would’ve eaten some had I had it. I LOVE egg salad sandwiches. Turns out I like the egg+mayo+salt+pepper part the most – I started with one egg, then had another. 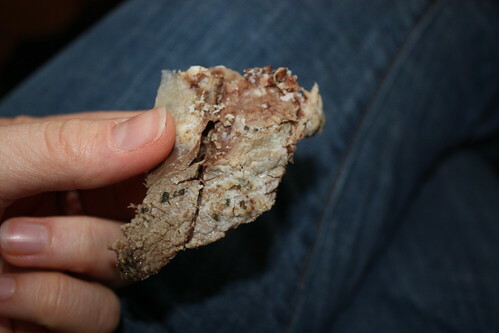 Also had some (cold) leftover beef. 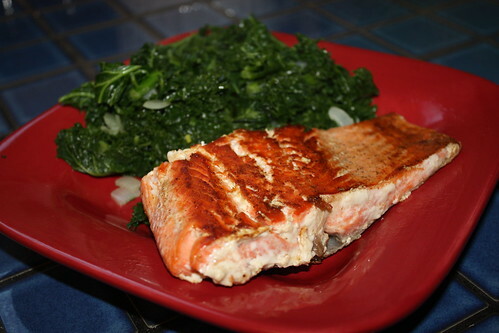 Jon made dinner tonight – salmon and kale. 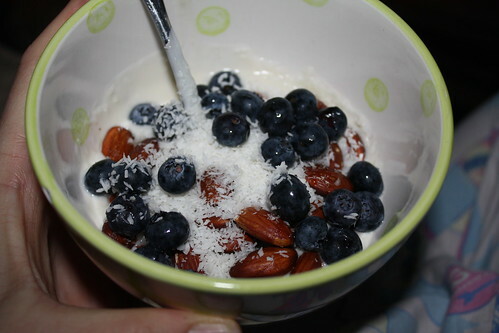 I ate a snack a little while later – yogurt, some almonds Jon roasted tonight, some unsweetened coconut and a few blueberries. I had a session with the trainer at 6AM – Jon went to the crossfit place. We were planning to go to pilates tonight, but we were both too tired. I was in my pajamas by 6PM. 2,204 calories, 145g fat, 117g carbs, 109g protein. The snack put me over the edge calorie-wise and stuffed-wise. I know I shouldn’t go to bed at 8:30PM, but whatever. I don’t handle the 5AM wake-ups very easily. I had never heard of this program, thanks for pointing it out. I don’t think you’re being cynical – the program sounds like a complete crock.